Dr. Francis A. Schaeffer (1912-1984) may very well be one of the most important Christian thinkers of the twentieth century. Schaeffer graduated from Westminster Theological Seminary and was heavily influenced by J. Gresham Machen, Cornelius Van Til, and the Dutch theologian Abraham Kuyper. In 1948, after a ten year pastorate in the United States, he moved his family to Switzerland to engage in missionary work. In 1955, Dr. and Mrs. Schaeffer founded L’Abri in a small mountain village in Switzerland. French for “shelter,” L’Abri became a refuge for people in need of spiritual help. The Schaeffers were especially interested in people who sought answers to basic philosophical and metaphysical problems. He writes, “To the best of my ability I gave the Bible’s answers. But all the time I tried to listen and learn the thought forms of these people. I think that my knowledge, whatever it is, is formed from two factors: 1) Forty years of hard study, and 2) Trying to listen to the twentieth-century man as he talked” (Eternity, March 1973). Schaeffer’s keen ability to listen carefully and engage the intellect of these people became a primary factor that contributed to his success. Students came to L’Abri from varied backgrounds – philosophy, medicine, architecture, science, and theology. The Schaeffers ministered to college professors, students, pastors, engineers, and lawyers to name a few. The common thread among all L’Abri visitors was a thirst for truth. These people sought answers to the basic questions of life: Who am I? Where am I going? What is my purpose in life? How does God fit in the scheme of things? The stated purpose of L’Abri is “to show forth by demonstration, in our life and work, the existence of God” (L’Abri, 16). L’Abri continues to operate and fulfill the vision of Francis Schaeffer even over twenty-five years after his death. The ministry of L’Abri may also be found in Holland, Australia, England, Sweden, India, South Korea and Massachusetts. 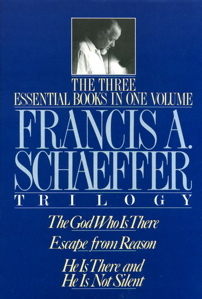 Francis Schaeffer published his first book, The God Who Is There in 1968. He subsequently wrote twenty-two books which have been translated into more than twenty-five different languages. A common unifying theme runs throughout Schaeffer’s books, namely, “the Lordship of Christ in the totality of life” (The Great Evangelical Disaster, 303). In the days to come, my goal is to expose readers to Francis Schaeffer and pay particular attention to his views on apologetics and the nature of the church.